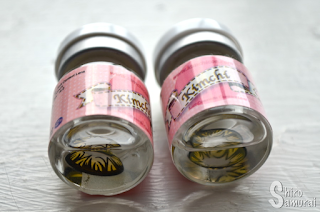 Today I'll review the cool Kimchi Kiss Gold lenses! ヾ(≧∇≦*)ゝThe yellow color doesn't always show up as brightly as one might hope but it does make my eyes appear some sort of mango color, haha. It's a pretty lens! These lenses sport a really unique design that sets them apart from the masses! I don't know why they are called Kimchi Kiss because to me the pattern looks like a fancy star, haha. I really like the design and wish it came in more colors because it's only available in gold, gray, pink, violet and blue – I'd seriously want to see these in red or green. 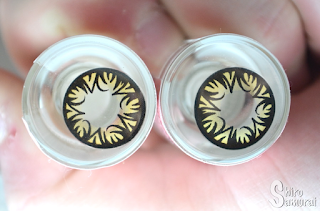 *_* The black limbal ring is kinda thick too and it gives a cute enlarging effect! As per usual with Kimchi lenses these are fairly big as well, not humongously big but the enlargement is big enough that it's easy to notice. These lenses don't really look good without eye makeup by the way, just a warning! I need to say that regarding comfort these are hella comfy! I put them into my eyes no problem and I didn't feel them at all from the first second. I even biked outside with my brother to go eat some hamburgers and I had to ask him along the way if I still had my lenses on, lol. xD I swear it didn't even feel like I was wearing lenses! These lenses don't hinder my vision or anything but I felt that occasionally there was a very slight blur, especially when my eyes got tired (I wore these late into the night). I managed to wear these for 4,5 hours before they started to feel a bit dry and a little bit before 5 hours I decided to take them off. All photos taken by me during a partially cloudy May evening. Dim yellow light in staircase. Bonus! Facing bright sunset outdoors with no makeup. The color definitely shows up as yellow/gold but it's not as vibrant as I might have hoped; it's still pretty but when viewed from a distance it makes my light blue-gray lenses appear honey or perhaps light tea colored? I don't know how to describe the color. ^^" I guess the amount of black streaks also adds to the impression that the lenses appear darker when viewed from a distance. In brighter lights they do stand out more but yeah, on cloudy days they don't show their best side. Nevertheless, it's a beautiful lens. 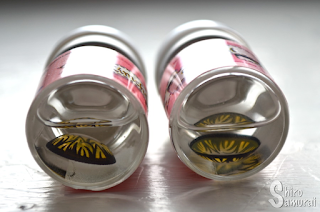 These lenses are yellow but aren't super bright; ends up looking honey/tea colored in average light conditions. Really pretty and unique star-like pattern with bold black streaks! Pretty good, since yellow lenses that show up decently aren't all that common. They blend surprisingly well though. These appear bigger than some other Kimchi lenses I've had, possibly because of the thicker limbal ring. Really good! I don't even feel that I have lenses on! I can wear them for approximately 5 hours before they start to feel dry. The slight blending effect is nice but a yellow/golden color combined with that intricate pattern is obviously contact lenses. Wow! I love the design! I really like when lenses are comfortable ><! 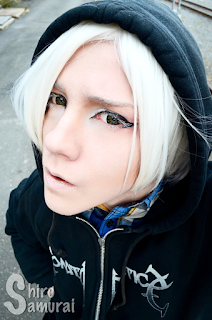 I think these lenses are osom in brighter lights :3! Wow it looks so magical!